In Pakistan, even though women constitute a majority of students in medical colleges, they are less likely to practice medicine or specialise, as compared to men. 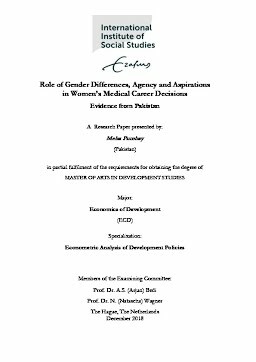 This research paper studies the labour market decisions made by women in medicine in Pakistan to explore why more men than women advance their medical careers. The paper uses primary data collected from students and recent graduates in private medical colleges and affiliated hospitals in Rawalpindi and Islamabad, Pakistan. Using experimental and empirical evidence, the paper studies the differences between women and men in the profession, and analyses factors affecting women’s sense of agency and career aspirations. It is suggested that social pressures, gender roles, motivation levels, initial reasons for joining medical colleges and household characteristics may influence women’s career aspirations and their sense of agency in career decisions.